Maybelline Super Stay 24h or L’oreal True Match, which one is the best Foundation? Maybelline Super Stay 24h or L’oreal True Match We’re still wondering which foundation to choose.. Which will be the best Foundation for me ? 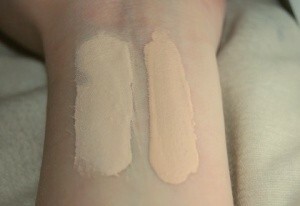 I try to compare two of my the best Foundation. Maybelline New York is one of those producers whose cosmetics know each of us. Ba – I dare say that she not only knows but also has a favorite product in her vanity case. For who has not once tempted to popular mascaras or lipsticks? Anyway, I write this every time, but it’s hard to introduce such a introduction and a brief summary of their achievements with a word of introduction;) Recently I tested and compared for you cream creams of this manufacturer – ie iconic Color Tattoo. You can find a movie about this topic here. Now it was the turn of the foundations. As the first I decided to test the latest products, and thus the improved version of Affinitone 24h – Super Stay 24h. What combines both foundations – apart from the long-lasting 24-hour formula and shades, is the Micro-Flex technology, which has been improved in Super Stay. It influences the perfect maintenance of the foundation, its flexibility and the ability to “move around” with every mimicry. It also makes the foundation resistant to abrasion (and how important it is – it works in any season). A novelty in the composition is silica – a mineral substance of natural origin, strongly absorbing sebum and moisture, so that the foundation is spread on the skin easily and pleasantly. And how is it really? Spreading is actually trouble-free and in a quick way, sponge or brush – we will do it equally effectively. The foundation does not leave streaks and does not work, I did not note the weighting – although it also depends on what you put under it. Undoubtedly, it can be counted as covering fluids, and if I have to narrow it down – it’s definitely for medium-concealing. In my case, Super Stay dealt with slight discoloration and also covered with delicate redness and blemishes. The aforementioned silica, which gives the matting properties, works quite well. The foundation nicely congeals on the skin, there is no feeling of stickiness and runoff, although I did not feel great dullness. So if you count on a strongly matted face, just use Anti-Shine from Kryolan 🙂 or some other powder, because without fixing it with a dry finishing product, the effect will not be as satisfactory. The cosmetic is generally stable – in a not-so-good condition it lasted 10 hours. I think it’s quite a decent result, and considering the last warm aura and my son’s abilities to “rub off” we have a make-up, it’s a really good result 🙂 The only dissatisfaction I have is the colors of the series – unfortunately I’m not able to choose the perfect color for myself. The brightest shade 05 – has too much pink in it, and the next one is slightly too dark. 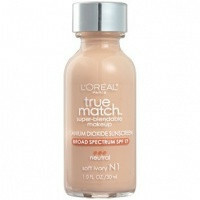 L’oreal True Match is the best Foundation for me. The range of shades is very rich, there are a lot of those with yellow pigmentation so you can easily choose for yourself the one devoid of pink tones. W – in yellow tones. Of course, I chose the one with yellow pigmentation, because my skinplays in warm shades. How to choose the best Foundation to my skin ? – good durability – in traditional conditions, I do not need to finish with powder in stone, though I also liked to add make-up to this durability. Maybelline Super Stay 24h the best Foundation? For some, the first two points may be a disadvantage, but it does not bother me. 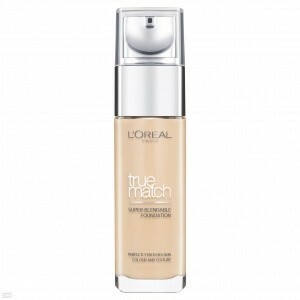 True Match is currently one of the brightest among my foundations, just perfect at the moment. Here I will present his shade in a collision with several others.